A reference to the holy village beneath Lake Kolhu/wala-wa, where the Zuni go to be with their ancestors after they have died. In Zuni mythology, before settling into permanent pueblos, the Zuni were in search of their final home in the Middle Place or Halona: Itiwana. While they traveled, the Zuni made temporary camps in various places, which later became sacred places. Eventually the groups split up and one group traveled down the Little Colorado River and founded a village at the lake at the junction of the Zuni and Little Colorado Rivers, this was Lake Kolhu/wala-wa. This village is known as Zuni Heaven or Kachina Village, or as recounted in Tony Hillerman's telling of the Zuni myth, Dance Hall of the Dead, as the lake is also the location where Zuni kachina reside when they're not among the people. In the tradition of the Pueblo peoples of the U.S. Southwest, the term kachina generally refers to protective deities that are generally understood to be supernatural manifestations of elements occurring in the natural world, such as weather phenomena, plants, and animals. 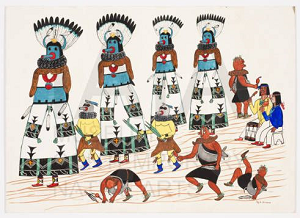 When kachina interact with the people, they are summoned by the sacred ritual of dance, and they move among the people by dancing. "Zuni Shalako," Museum of Contemporary Native Arts ( j_43_wm_2014.jpg)Museum of Contemporary Native Arts. Santa Fe, New Mexico. All rights reserved. Use with permission only.